Statue of the Royal Canadian Mint's 1997 Silver Dollar (commemorating the 25th anniversary of the 1972 Canada/USSR Hockey series) stands outside the Hockey Hall of Fame building, downtown Toronto, Ontario, Canada. A stone platform with two metal maple leaves holding a white medallion. This statue celebrates the 25th anniversary of the 1972 hockey series of Canada/USSR. 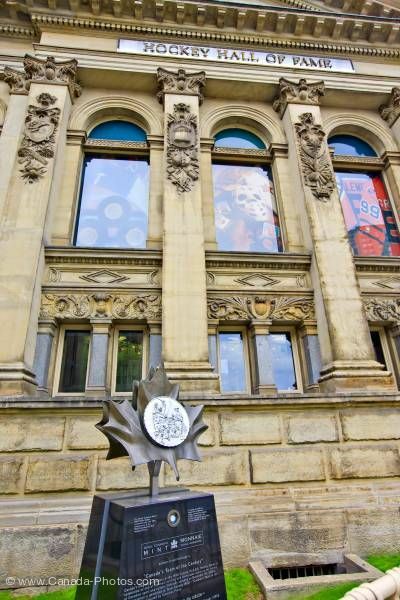 The statue is displayed at the Hockey Hall of Fame building with its beautiful classic architectural details.